Retail Price: $21.00 Log in for LOWEST PRICE! About 30 years ago I received a book on the Rhone from its author, Mel Master. Mel was such a fan of the area, he ended up buying property in nearby Provence and began producing some great wines. The book was a fascinating history of a fascinating place. One of the most heralded properties he talked about was Ch?teau La Nerthe, considered the best of the best in Ch?teauneuf-du-Pape. I searched high and low and couldn't find a drop of wine from that chateau. A few years later, a wine salesman told me he had picked up a new line, Chateau La Nerthe. And would I like to taste it? I was flabbergasted! So was he, as I was the only customer who knew what it was. The wines were, and still are, heavenly. I had the pleasure of dining with the owner, who had made his fortune in the insurance business. Wine was his first love. Upon learning the history of La Nerthe and how it had stopped producing, he set out to restore it to its former glory. He couldn't have done a better job. Our selection comes from Tavel, an area next to Ch?teauneuf-du-Pape, one of the finest ros? producing areas in the world. Like Chateauneuf, it is mostly Grenache with touches of Mourvedre and Cinsault. 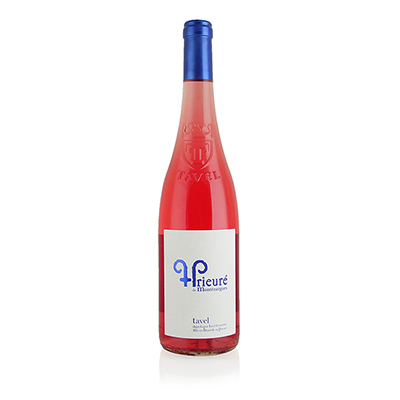 It is the ultimate in Rose, with alluring color, tropical aromas and exciting flavors. The finish seems to never finish.